This potent combination of calendula, comfrey, and arnica infused in organic St. John's Wort and olive oil. Cooling for many irritating skin conditions. Calendula has been used for eons for itchy skin conditions. Comfrey too, called "knitbone" in the 18 and 19th centuries and used for "bone and ruptured skin" healing. St. John's Wort is magically anti-inflammatory. Mom's like it to prevent infection in minor "boo-boos." I had shoulder surgery and tried everything for pain since I was unable to take the pain medicine. this was a life saver. It helped the inflammation and pain. Love it. I always have an extra jar on hand in case I run out. 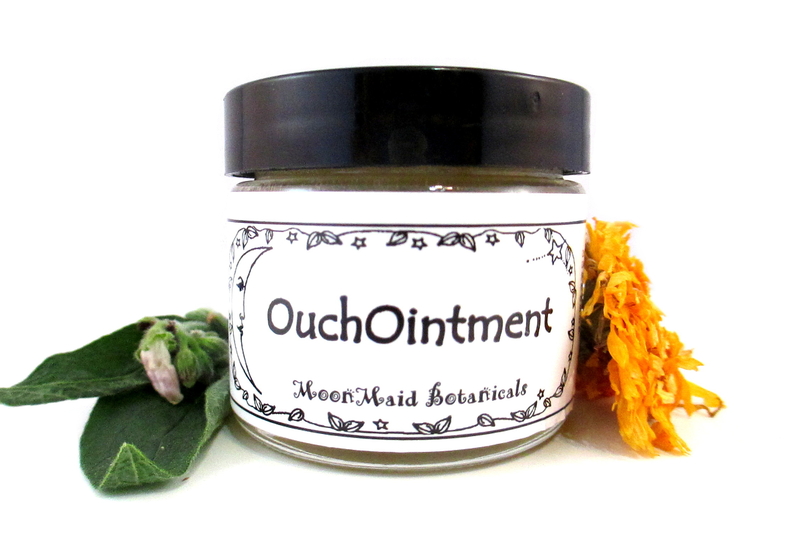 This ouch ointment is wonderful for healing sores and coating the skin to prevent anything entering the wound. You have discovered a wonderful combination. I would like to recommend this to the sick and perhaps be a supplier of this, is this possible? 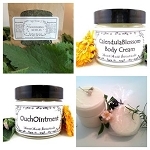 I use both the Ouch Ointment and the Radiant Rose cream to heal bangs and bruises that I get. I use the ouch ointment the first day or so to heal the wound and put the radiant rose cream on it to heal the skin after the wound heals enough to put a cream on it. I love your ouch ointment. My husband and I use it for everything all the time:dry nose (we live be in Colorado! ), cuts, scrapes, burns. It's our go-to for almost any injury,. Thank you, Cynthia!